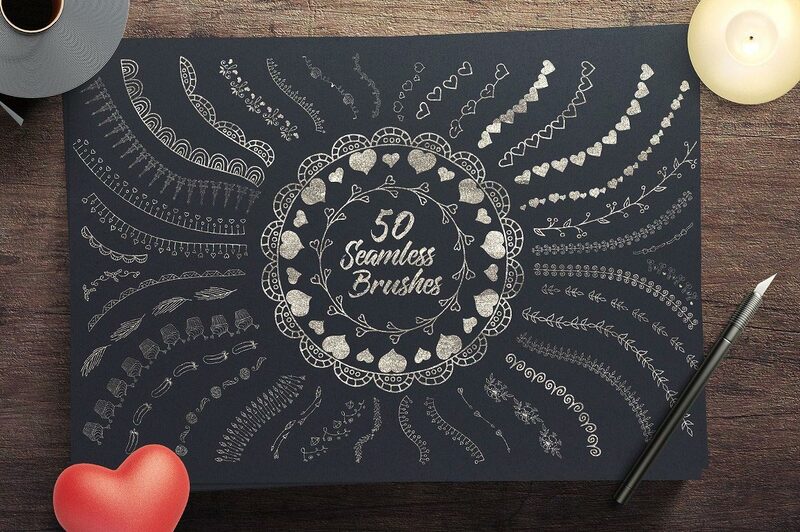 Access All Areas members have a huge collection of seamless brushes for Adobe Illustrator to download this week, courtesy of Tatiana Lapina from Creative Veila. These Romantic Dreams brushes are perfect for designing wedding invitations and celebration cards, composing love-themed illustrations, decorating typography compositions, creating printable and apparel designs, promo banners and so much more! Tatiana Lapina is a freelance graphic designer and enthusiastic photographer with a passion for creating unique things. She offers interesting and unique resources in her Creative Veila store, including lots of brilliantly illustrated vector graphics packs, mockup templates and scene creators. Each brush can be applied to any vector shape with one click in Adobe Illustrator. Since they’re vector graphics, the brushes can also be adjusted with ease by altering the stroke sizing. Choose from a range of seamlessly repeating patterns, including heart shapes, elegant florals and quaint illustrations. Compatible with Adobe Illustrator CC. Thank you Creative Veila and Thanks to You, Chris! Thank you Tatiana (and Chris!) for sharing!